The Web is Dead – Long Live Physical Stores! In retail, the future – if not the present – is online. From Amazon to Zulily, everyone’s buying online. We’re a nation of couch potatoes, sitting on the sofa, surfing on our iPads, buying whatever we need or just want without even getting up – well, at least until the UPS guy shows up at our door. What this means is clear: maintaining a superior and well maintained brand experience (“Brand Uptime” as it’s also called) is key. How? Well, maintaining your Brand Uptime is directly related to maintaining your Store Uptime. And that’s driven by an optimized and well run facilities management program. Whether it’s making sure that equipment is fully functioning, all scheduled and preventive maintenance occurs, or necessary store service requests are handled efficiently and promptly, retailers need to focus on delivering a superior in-store experience. Managing a retail chain’s physical presence across scores to thousands of locations is not easy. But even stores that want to drive more towards a digital experience need to remember that “physical stores help retailers drive online sales.” In fact, former ‘pure play’ online retailers like Warby Parker, Athleta and Bonobos are going ‘old school’ (aka ‘multi-channel’) by opening physical locations. In doing so, they’ll need to focus now not only on their site uptime but their Store Uptime as well. Both are critical to delivering a high level of Brand Uptime. And without that, customers will use their feet – or their mouse – and simply go elsewhere. Even traditional retailers like Restoration Hardware and Burberry are expanding their physical presence while others like Uniqlo and H&M are seeking new markets. 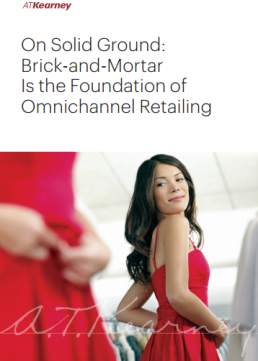 A.T. Kearney found that “top retailers with multiple channels are spending 76% of their capex on store experience. So regardless of a retailer’s strategy, maintaining your facilities and optimizing your repair and maintenance program is a must.